He's back in purple ladies and gents! 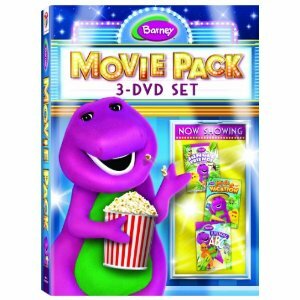 Have a holly jolly holiday this year with everyone’s favorite purple T-rex as he and his friends ring in the joy of the season in Barney™: Holiday Favorites 3-DVD Gift Set, unwrapping in stores October 18, 2011 from Lionsgate and HIT Entertainment. Spend the night before Christmas at Santa’s Workshop, search for the perfect gold star to top the Christmas tree and welcome fellow preschool favorites Bob the Builder™, Kipper™, Thomas & Friends™ and Pingu™ for additional frosty, festive fun. Trusted by moms and adored by children, Barney displays sharing, caring, imagining, dancing and learning on television and through digital media, live events, home entertainment, toys, and publishing. The Emmy® award-winning series, Barney & Friends™ is one of the top-rated preschool shows today, airing on PBS KIDS® and Sprout®. I can't stand Barney..(Sorry!!!) BUT-with that being said...kids LOVE that purple Dinosaur. Give the gift of friendship this holiday season with Barney™: A Very Merry Christmas – The Movie, arriving on DVD, Digital Download and On Demand October 11, 2011 from Lionsgate and HIT Entertainment. Join Barney and Baby Bop™ on their journey to Santa’s Workshop where they learn that the true spirit of Christmas is the joy of giving and caring for others. Trusted by moms and adored by children, Barney displays sharing, caring, imagining, dancing and learning on television and online and through live events, home entertainment, toys and publishing. The Emmy® award-winning series, Barney & Friends™ is one of the top-rated preschool shows today, airing on PBS KIDS® and Sprout®. Title Copyright: © 2011 Lyons Partnership, L.P. The Barney name and character, related characters and the overlapping dino spots and Barney and star logos are trademarks of Lyons Partnership, L.P. Reg. U.S. Pat. & Tm. Off. and other countries.